April 23, 2014 Bishop Donald Hilliard, Jr. presented the town hall discussion: "African-American and Latino Family Crisis - "Do You Know Your Daddy?" at Cathedral International located 205 Smith Street in Perth Amboy, NJ. 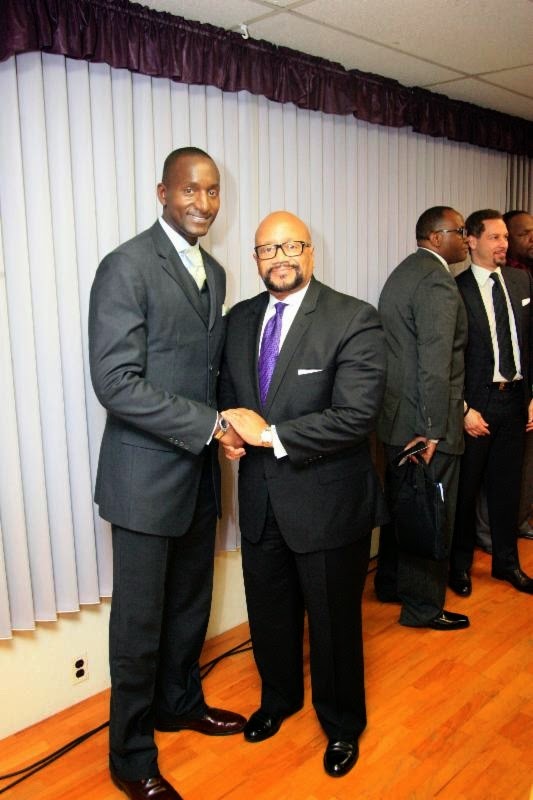 Bishop Hilliard, along with celebrated author Dr. Randal Pinkett, served as moderator to a very diverse panel which consisted of selected celebrities and community activists. The panel included: Chris Broussard (NBA Analyst - ESPN) Tyrone Muhammad (Founder, Morticians That Care) Obery Hendricks, Jr. (Professor - New York Theological Seminary) Fredrica Bey (Executive Director WISOMM Holistic Preschool Center) Kevin E. Taylor (Elder and Co-Founder - Unity Fellowship Church NewArk) and Esteban Santa (Pastor, Iglesia Cathedral Internacioinal). Dr. Pinkett posed the question to the audience and panel "Do You Know Your Daddy?" This powerful question catapulted the much needed open-ended discussion, and commenced an engaging, thought-provoking conversation about the dynamics of fatherless households in America, particularly for the African-American and Latin youth as well as the demise of community and family. The event was well-received by approximately 1,000 in attendance, 850 on-line Twitter participants https://twitter.com/Bishop_Hilliard and was also viewed on www.streamingfaith.com/Cathedral-International. Bishop Hilliard was passionate and continually emphasized "This discussion is not just an opportunity to voice frustration; its purpose is to determine how we can best resolve this epidemic." Perth Amboy Police Chief, Benjamin Ruiz was also in attendance sharing his heartfelt sentiment, "...Fathers in the home, what are you doing?...You are more than just a piece of furniture..." Several established community youth organizations were in attendance voicing their concerns and asked churches and philanthropic foundations for "help". One major take-away from the 2-hour dialogue between Bishop Hilliard and guests was that there will be more planning, more preparation and more positive outcome aimed toward designated solutions.This is just the beginning of continued service for our youth, family, and our communities.